Looking for adventure? Why not check out this Blast From the Past! Earlier this week Awesome K and I went on a whirlwind tour of a few of Colorado’s finest breweries. Our Epic Adventure included a trip to the Odell Brewery in Fort Collins (as described in Part I), as well as a brief trip to the Fort Collins Brewery and with a grand finale at the Oskar Blues Brewery in Longmont. 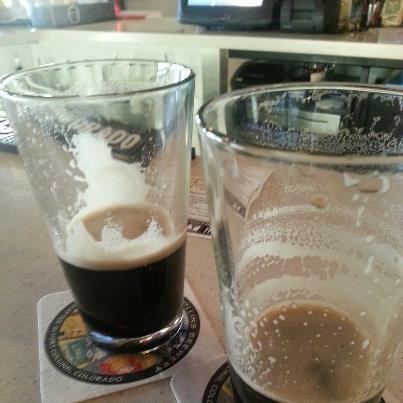 After touring the Odell Brewery, A.K and I skipped down the street – arm in arm – down to The Fort Collins Brewery. Ok, maybe we didn’t actually skip arm in arm, but we could have. We were kind of hoping to take a tour of their brewery while we were there, but they only do tours on Saturdays, and it was a Tuesday. We could see the brewery through the glass windows in their restaurant, Gravity 1020, so we we were able to catch a glimpse of their beer magic. While there we grabbed a quick snack, and yes, another beer. I had something dark with a hint of chocolaty goodness, and A.K had something dark with a hint of something…else that was delicious. Our snack, however, was A LOT more memorable. A.K introduced me to Poutine. “Fresh-cut french fries smothered in Kidd Lager mushroom gravy and topped with cheddar cheese curds” with some steak added. Sweet Baby Cheesits this was one of the most delicious things I have eaten in a long time. The mushrooms melted in my mouth, the fries weren’t too soggy, and the cheese was delectable. A true delight! After out wonderful appetizer and beer, we trucked on down to Longmont for dinner. I have been to Oskar Blues a couple of times before, but I have to say that going with A.K was a totally different, and much better experience. He makes everything an awesome adventure! For dinner at Oskar Blues, I had the BB King Burger with a side of mashed potatoes, because that’s how I roll. A.K was a little better about his dinner diet, and had the Jambalaya. I washed down my incredible burger with some of Mama’s Little Yella Pils. After all the dark beer of the day, it was a refreshing and light change. Not normally something I enjoy, but I loved the pairing with the burger. I had heard of the Tasty Weasel, but had never been in. Surprising, since it has such a great name! I convinced A.K to stop in with the promise of Skee-Ball. Not to pass up a chance to show off his mad skills, we swung by after our delicious dinner. 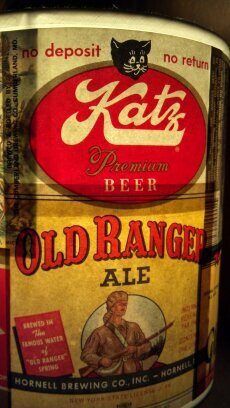 A.K had just recently had a Tap Takeover at his bar, The Archive Room, with Oskar Blues as the star. It was a huge success, and it was neat to see, and try, some of the beer that was featured at his Takeover. He and his bar are also planning on having their holiday party with Oskar Blues, and after eating at the Homemade Liquids and Solids restaurant, the Bar Manager was hoping to incorporate dinner into his holiday event. I had thought that they might also visit the Tasty Weasel, if the Skee-Ball was worth it…but first, our reconnaissance mission to the warehouse hole in the wall bar/brewery. 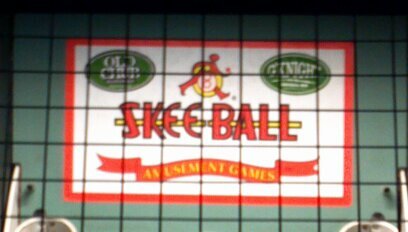 Skee-Ball and Beer? Don’t mind if I do! Little did I know when we walked in that the Weasel was actually the BREWERY! Of course a lot of the operation was done for the evening, but it was a really neat surprise to see the brewery dwarfing the seemingly small bar. 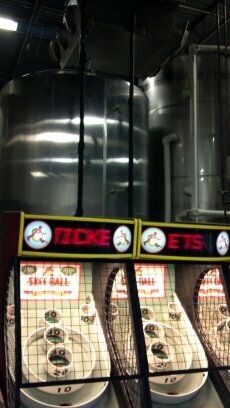 After grabbing a handful of peanuts, another dark delicious beer, and some quarters, we found our way to the Skee-Ball. After a few “practice” rounds, and getting schooled by an eight-year-old (why there was a child in the bar is beyond me…), A.K started to get into a groove. I was impressed with my score of 220, but after hitting the hundred mark a few times in a row, I was quickly dominated. Turns out A.K really does have mad skills! He went to the bar to get more quarters, leaving me to marvel at the brewery next to me. The warehouse/brewery seemed huge! I wished I could see more of it, and made a mental note to find out tour times for the next time I was in Longmont. A.K came skipping back (not really, he’s just so energetic that I imagine him skipping through fields of hop flowers) and asked me if I had ever met The Gubna, of the famous Gubna IPA beer. 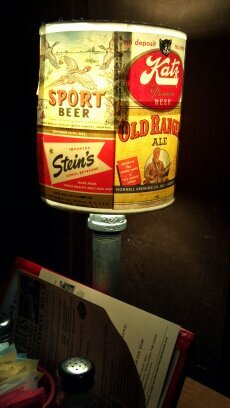 I said I had not, and suddenly I was whisked away to meet one of the founders of Oskar Blues! A.K told The Gubna of our adventures throughout the day, and he was a little shocked that I had never been on a brewery tour before that morning, and insisted on taking us on a personal, private brewery tour RIGHT THEN! How could a girl say no?! So, after grabbing another pint of delicious dark beer, we were off! There are not enough words to describe the experience; Impressive, Wondrous, Marvelous, Delightful, Sense-sational! It was so good, I have to make up words. We learned about the expansions of the brewery, where the company was going next (and in what states), and about their unique flavoring process. 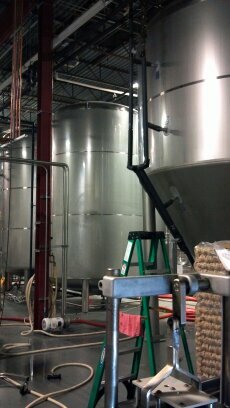 Being on such an intimate tour of the brewery with The Gubna couldn’t have been any better….or so I thought! While we were investigating the wine barrels and discussing various tastes to come from them, The Gubna pointed to a man in workout clothes talking on a cell phone, “Hey brother! What’s happenin’?” Brother? As in Dale? Of DALE’S PALE ALE?! Yup, the one and only. So not only did I get to meet The Gubna, but A.K and I had the distinct pleasure of meeting Dale! He was incredibly nice, gave us some more fun facts, then we were off again on the rest of our tour! One thing that really struck me while we were hanging out with The Gubna was how in tune with his business, and his people, he was. Every single person, whether it was the dude mopping the floors, the man operating a forklift, or one of the brewers, he knew them all by name, and was genuinely happy to see all of them. A warm hearty greeting was given to each person he saw, and that meant more to me than the types of hops used…a man who is that passionate about his company, and that good with his employees, is really something. I could gush on and on about it, but I will just leave it at the fact that I was impressed. After we were done with the best brewery tour a person could hope for, we were pretty tuckered out. We managed to finish our beers, play a couple more rounds of Skee-Ball, then we were headed home. 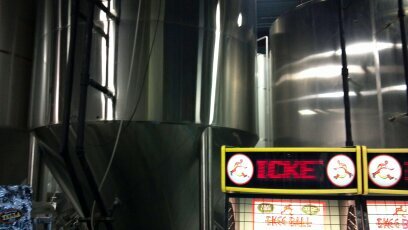 All in all the Epic Brewery Tours were just that, Epic. I went from knowing almost zero about brewing, to having met and walked with some of the founders of some of the best beers in the country. Learning their histories, smelling the hops, seeing the processes involved, it was pretty mind blowing, in the coolest way. I am now more than a little obsessed with learning more about the brewing process (I might even dabble in making my own…or…or not), and I am more than a little obsessed with learning more about ALL THE THINGS! I want to go on every tour of every factory, ever. I want to know how tattoos work. 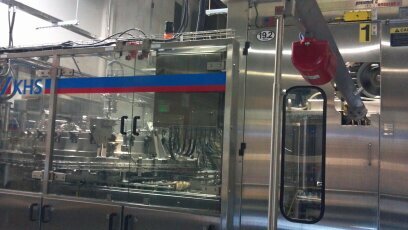 I want to see candy being made. I want to go to NASA and learn about space travel! I WANT TO KNOW ALL THE THINGS! Looks like I have a lot of adventure planning to do!